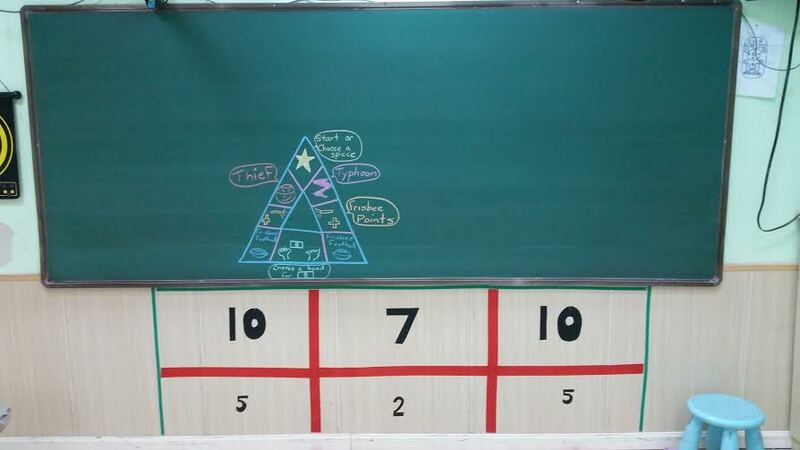 Frisbee Points: Mark the walls (or board) with point targets to shoot at. Each student will get one throw of the (Foam) Frisbee to try and win points. 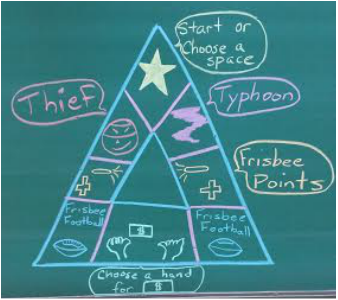 ​Frisbee Football: As seen in the diagram below… The classroom has two lines at opposing ends on the floor, using tape. These are the “End Zones” like in American Football. The (Plastic) Frisbee is the “Football”. Students win by pushing the Frisbee onto the opposing teams line. Choose one student from each team to play. The Frisbee starts on the line. Student A is allowed two hits each round. (Flicking the Frisbee with their hand) If the student can flick the Frisbee onto the opposing teams line they are the winner. If the Frisbee is flicked past the opposing teams line, they are the instant loser. 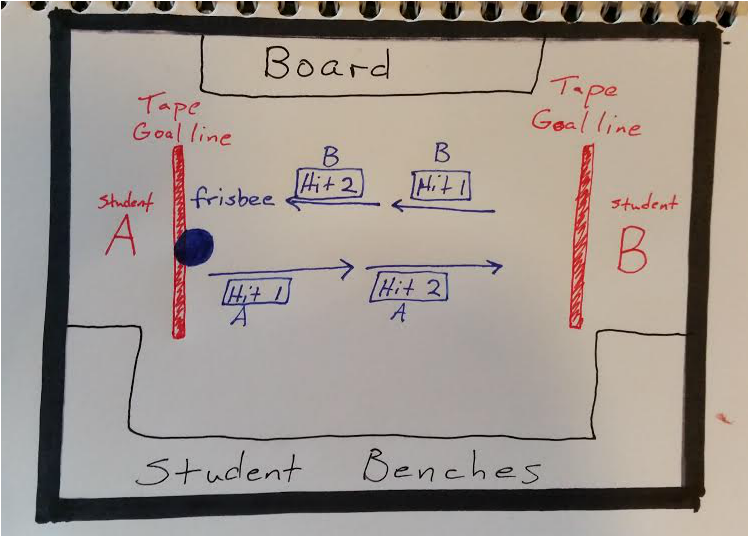 If student A does not flick the Frisbee onto the opposing teams line in 2 flicks, then student B gets to flick the Frisbee 2 times (from the spot the Frisbee had stopped… Do not move the Frisbee back to the goal line) to try and have it land on Student A’s line. *In short, the Frisbee is flicked back and forth by the two players until it lands on the opposing teams goal line/ OR a student flicks the Frisbee too far, and it goes over the line,,, in which case that student loses. *If student A flicks the Frisbee onto the goal line on the first attempt, Player B is allowed to try to Match, student A by reaching his/her goal line. *The winner of the game is awarded points. *This game is pretty fast, and lasts only 10-30 seconds usually, allowing all children a chance to play. *All ages, 4-16 enjoyed this game. For younger students it was difficult to not hit the Frisbee to hard, in which case they lost, or too soft, in which case the other team easily won.